Objectives Postpartum haemorrhage (PPH) is a major cause of maternal mortality and morbidity worldwide. Experimental studies support the hypothesis that oxytocin administration during labour, a common although not evidence-based practice, may increase the risk of atonic PPH. The clinical studies, however, are inconclusive. The objectives of this study was to investigate the association between the level of oxytocin exposure during labour and the risk of severe PPH and to explore whether the prophylactic use of oxytocin after birth modifies this association. Design Population-based, cohort-nested case–control study. Setting 106 French hospitals from December 2004 through November 2006. Participants Women with term singleton vaginal deliveries, after an uncomplicated pregnancy. Cases were 1483 women with severe PPH, defined by peripartum change in haemoglobin of ≥4 g/dl or need for blood transfusion. Controls were 1758 women from a random sample of parturients without PPH. Main outcome measures The independent association between the level of oxytocin during labour and the risk of severe PPH was tested and quantified with ORs through two-level multivariable logistic regression modelling. Results Oxytocin was administered during labour to 73% of cases and 61% of controls (crude OR: 1.7, 95% CI 1.5 to 2.0). After adjustment for all potential confounders, oxytocin during labour was associated with a significantly higher risk of severe PPH (adjusted OR: 1.8, 95% CI 1.3 to 2.6) in women who did not receive prophylactic oxytocin after delivery; the OR for haemorrhage increased from 1 to 5 according to the level of oxytocin exposure. In women who had prophylactic oxytocin after delivery, this association was significant only for the highest exposure categories. Conclusions Oxytocin during labour appears to be an independent risk factor for severe PPH. The results emphasise the need for guidelines clarifying the evidence-based indications for this procedure and the minimal useful regimens. Postpartum haemorrhage is the main component of maternal morbidity, and increase in its incidence is reported. Experimental studies support the hypothesis that oxytocin administration during labour, a common although not evidence-based practice, may increase the risk of atonic postpartum haemorrhage. The clinical studies, however, are inconclusive. In this study, oxytocin during labour appears to be an independent risk factor for severe Postpartum haemorrhage, with a dose-related association. Our results emphasise the need for guidelines clarifying the evidence-based indications for this procedure and the minimal useful regimens. Source population: large population-based cohort; representativity of cases and controls. Detailed data on oxytocin administration during labour collected from medical files. Detailed data on potential confounders. Inherent limitation of observational studies: residual confounding cannot be excluded, although all potential confounders were taken into account. Obstetric haemorrhage remains one of the leading causes of maternal mortality in developed countries, accounting for 10%–30% of direct maternal deaths in countries with maternal death enquiries.1 2 It is also a major component of severe maternal morbidity.3 4 Recent increases in the prevalence of postpartum haemorrhage (PPH) have been reported in several developed countries.5–7 This rise is limited to immediate/atonic PPH in Australia, Canada and the USA and remains significant when temporal trends in known risk factors are taken into account.5–7 This underlines the need for further investigation of possible PPH risk factors. We focused on components of care during labour because they might affect uterine tone, have changed over time and can be modified. A good candidate is the administration of oxytocin, commonly used to induce or augment labour. Although data are sparse, oxytocin infusion during labour appears to have become a routine procedure in developed countries that may concern a significant portion of parturients, sometimes even a majority.8–12 This evolution merits concern because it suggests that the use of oxytocin has been extended from specific to broader but poorly defined indications without either an evidentiary basis13 14 or a rigorous evaluation of its safety, especially for the risk of PPH. Clinical studies of the effect of oxytocin administration during labour on the risk of PPH have reported conflicting results,20–24 and their conclusions are impaired by methodological limitations, mainly the failure to take into account the indication bias associated with prolonged labour, the amount of oxytocin infused or the possibility of a differential impact according to whether the woman received prophylactic oxytocin after birth or not. This flawed evidence likely contributes to the common belief that this treatment has no serious adverse effects. Our objectives in this large population-based study were to investigate the independent association between the level of oxytocin exposure during labour and the risk of severe PPH and to examine whether the prophylactic use of oxytocin after birth modified this association. This was a population-based, cohort-nested case–control study. The study population included women selected from the Pithagore6 trial, a cluster randomised controlled trial conducted in 106 French maternity units operating as six perinatal networks. Its main objective was to evaluate a multifaceted educational intervention for reducing the rate of severe PPH, and it found no significant difference in this rate between the two groups of hospitals (details available elsewhere25). The 106 Pithagore6 maternity units represented 17% of all French maternity units and accounted for 20% of French deliveries. Data were collected for 1 year in each unit from December 2004 through November 2006. PPH was clinically assessed by obstetricians or midwives or defined by a peripartum haemoglobin (Hb) delta of >2 g/dl (considered equivalent to the loss of >500 ml of blood). Prepartum Hb was measured during routine prenatal care near the end of pregnancy; postpartum Hb was the lowest measurement found 3 days after delivery. Birth attendants in each unit identified all deliveries with PPH and reported them to the research team. A research assistant reviewed each unit's delivery suite logbook monthly and any available computerised patient charts. For every delivery with a mention of PPH or examination of the uterine cavity or manual removal of the placenta, the patient's obstetrics file was further checked to verify the PPH diagnosis. During the 1-year data collection period, 9365 cases of PPH (defined either by estimated blood loss or by drop in Hb) occurred among 146 781 deliveries in the 106 Pithagore6 units, for a total PPH incidence of 6.4%. A representative sample of women without PPH in the same units during the same period was assembled by randomly selecting 1/60 of all other deliveries. We selected the study population from the Pithagore6 population by excluding subgroups of women likely to introduce bias due either to selection or major confounding by indication or other factors in the association between the augmentation of labour and the risk of severe PPH: women with pre-existing conditions, previous uterine surgery including caesarean delivery, multiple pregnancy, obstetric disease, fetal death, preterm delivery (before 37 weeks of gestation) and caesarean delivery. The study population finally included women with vaginal delivery of a term (at least 37 weeks) singleton after an uncomplicated pregnancy. For our case–control analysis, the 1487 cases were women with severe PPH defined by a peripartum Hb delta of 4 g/dl or more (considered equivalent to the loss of 1000 ml or more of blood) or by the need for blood transfusion; the delay between the prenatal Hb measurement and the delivery was (mean ± SE (25th, 75th percentile)) (in days) 11±0.7 (0, 14); a total of 1758 parturients without PPH served as controls. Figure 1 outlines the process that selected these two groups. Selection of the study population. PPH, postpartum haemorrhage. *Severe PPH: peripartum haemoglobin delta of ≥4 g/dl or need for blood transfusion. †Randomly selected representative sample. Characteristics of the woman, pregnancy, labour and delivery were recorded shortly after delivery from the patient's chart. The study variables included maternal age, body mass index (BMI) before pregnancy, previous PPH, previous uterine curettage, primiparity, induction of labour, fever (>38°C) during labour, epidural analgesia, duration of active phase of labour (in minutes), oxytocin during labour, duration of expulsive efforts (in minutes, categorised according to the 50th, 75th and 90th percentiles of distribution in the control group), gestational age at delivery (in weeks, categorised as term (37–41) or post-term delivery (>41)), operative delivery, episiotomy, perineal tear, birth weight (in grams) and prophylactic oxytocin administration after delivery. Oxytocin exposure during labour was studied as a binary variable and also with three quantitative variables: total dose (in international unit), maximal infusion rate (in milli international units per minute) and total duration of infusion (in minutes). These quantitative variables were categorised according to the 50th, 75th and 90th percentiles of their distribution in the control group, rounded to the nearest whole number. Duration of labour, in particular its active phase, is a major confounding factor in the association studied and its assessment received special attention. The active phase of the first stage of labour starts when cervical dilation reaches 3 cm.26 To prevent bias from the truncation of this record for women in labour before reaching the hospital, we applied several rules. The duration of the active phase for women admitted with cervical dilation of 3 cm or less was the time recorded between 3 cm and full dilation. In women admitted with cervical dilation >3 cm (12% of cases and 27% of controls), we hypothesised a constant speed of cervical dilation during this phase, and the total duration of the active phase of labour was estimated from each woman's mean cervical dilation rate (derived from the time of dilation measurement at admission to full dilation). Because mean cervical dilation speed could not be reliably estimated for women whose cervix was fully dilated at admission, the duration of their active labour was considered missing (0.7% (n=10) of cases and 1.3% (n=23) of controls). The case and control groups were compared with the χ2 test for the characteristics of the women, pregnancies, labour and deliveries. The independent effect of oxytocin treatment during labour on the risk of severe PPH was tested and quantified with a two-level multivariable logistic regression with a random intercept to take into account the hierarchical structure of the data, with women clustered in maternity units. We adjusted for covariables previously described as risk factors for severe PPH and for variables found to be potential confounders in bivariate analyses. Clinically relevant interactions were tested between oxytocin for augmentation of labour and other factors—parity, induction of labour and prophylactic oxytocin after delivery. Less than 8% of cases and controls had missing values for any variables except BMI and duration of expulsive efforts, for which we created a specific missing value indicator variable for regression analyses. Sensitivity analyses tested the robustness of the results under best- and worst-case hypotheses of distribution of the missing values. Subjects with any missing values for other characteristics of women, labour and delivery were excluded from the multivariable analyses: 63 (4.3%) cases and 55 (3.1%) controls. A secondary analysis, using the same control group, limited the case definition to women whose severe PPH was due to uterine atony. We estimated, based on a sample size of 1500 patients with severe PPH and 1500 controls, that the power of the study would exceed 80% for detecting an OR of 1.5 for exposures with a prevalence of 5% or more among controls and for detecting an OR of 1.3 for exposures with a prevalence of 15% or more among controls. Statistical significance was defined as a p value of <0.05. Analyses were performed with Stata V.11 software (Stata Corporation). 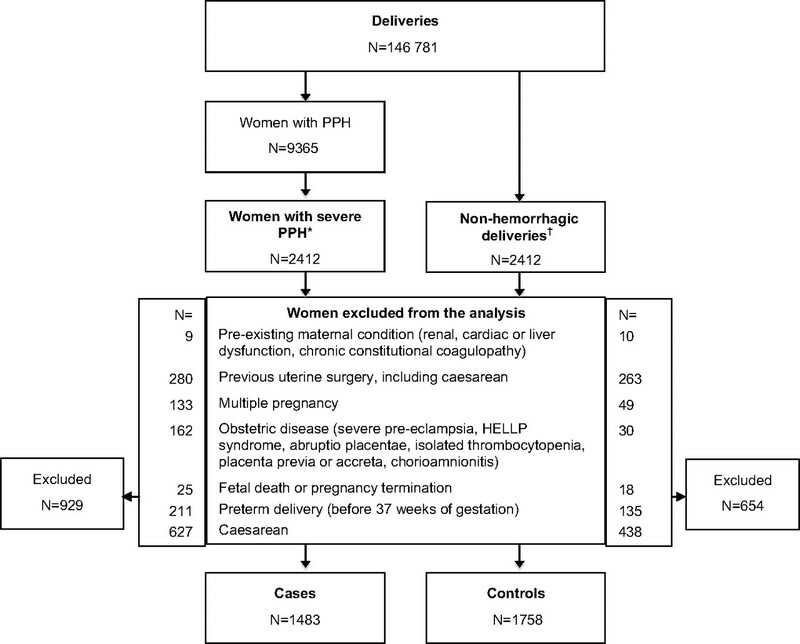 Severe PPH was due to uterine atony in 545 (37%) women, partial or complete placenta retention in 255 (17%) women and cervical, vaginal or perineal wounds in 324 (22%) women. No cause was identified for 359 (24%) women. Overall, 315 (21%) women had blood transfusions, 68 (5%) had arterial embolisation, 25 (2%) had vascular ligation and 25 (2%) had a hysterectomy; 99 (7%) were transferred to intensive care. One woman died. Women with severe PPH were older, more often primiparous and had a previous PPH more often than controls (table 1). Post-term delivery, induction of labour, epidural analgesia, longer labour, operative delivery, episiotomy or perineal tears and neonatal macrosomia were also more frequent in cases (table 2). Prophylactic oxytocin after delivery was more frequent in the control group. Oxytocin was administered during labour significantly more often to women with severe PPH (73%) than to controls (61%) (OR: 1.7, 95% CI 1.5 to 2.0) (table 3). The crude OR for haemorrhage increased from 1 to 4 depending on the oxytocin infusion rate, duration of infusion and the total duration at a maximal rate (table 3). There was a significant quantitative interaction between oxytocin during labour and its prophylactic use after birth for the risk of severe PPH (p=0.004 for Wald test of interaction). The crude OR for severe PPH associated with oxytocin during labour was 2.3 (95% CI 1.8 to 3.0) in women who did not receive prophylactic oxytocin after birth (N=593 cases and 518 controls) and 1.6 (95% CI 1.3 to 1.9) in women who did (N=890 cases and 1240 controls). We then stratified our multivariate analyses by the prophylactic use of oxytocin after delivery (tables 4 and 5) to examine its role in more detail. When prophylactic oxytocin was not administered after delivery, oxytocin exposure during labour was associated with a higher risk of severe PPH, after controlling for all potential confounders (adjusted OR: 1.8, 95% CI 1.3 to 2.6) (table 4). The strength of the association increased with the amount of oxytocin infused. The risk of severe PPH, compared with that in women who did not receive oxytocin during labour, was about three times higher for a total dose from 2.0 to 4.0 IU (adjusted OR: 3.3, 95% CI 1.8 to 45.9) and six times higher for a total dose of >4.0 IU (adjusted OR: 5.7, 95% CI 2.5 to 12.9). Similarly, the association of severe PPH with the maximal infusion rate of oxytocin appeared dose related: the adjusted OR was 2.2 (95% CI 1.3 to 3.8) for a maximal rate between 10 and 15 mIU/min and 3.2 (95% CI 1.7 to 6.1) for a maximal rate of >15 mIU/min (table 4). Among women who received prophylactic oxytocin after delivery, labour augmentation with oxytocin, considered globally, was not associated with a higher risk of severe PPH (adjusted OR: 1.1, 95% CI 0.8 to 1.5) (table 5). However, when the level of oxytocin exposure was considered, the risk of severe PPH appeared significantly higher for women in the most exposed categories: the adjusted OR was 2.1 (95% CI 1.3 to 3.3) for a total dose of >4 IU and 1.7 (95% CI 1.1 to 2.5) for a maximal infusion rate of >15 mIU/ml. Sensitivity analyses showed that the various hypotheses about the distribution of missing values for BMI and duration of expulsive efforts did not change the results. The secondary analysis of cases limited to women with severe atonic PPH (n=545) and the same control group provided similar results (details provided in supplementary table). We found an independent dose-related association between oxytocin infusion during labour and severe PPH in women who did not receive prophylactic oxytocin after delivery. The association between oxytocin during labour and severe PPH in women who had prophylactic oxytocin after delivery was significant only for the highest category of exposure. Despite particular attention to controlling for potential confounders, we cannot completely rule out the possibility that this association is due to residual confounding. Nonetheless, a residual confounder related to uterine tone that would both increase the need for oxytocin and the risk of PPH is unlikely, given our careful adjustment for duration of labour. Our study design had several strengths. It was population based, and the resemblance of the Pithagore6 source population to the national population in terms of the characteristics of women and units25 27 enhances the external validity of our results. The sample size provided adequate power to study the association of severe PPH with infrequent exposures, such as the highest oxytocin dose categories. The selection of cases and controls from the same population-based cohort ensures the comparability of these two groups. In view of the controversy over the definition of severe PPH,28 we chose an objective criterion of severity (peripartum drop in Hb) because it is more likely to be determined consistently than estimated blood loss and especially because it is not dependent on medical practices. Data, collected directly from the medical files, included details on oxytocin administration (ie, quantities, timing and infusion rates) and other aspects of labour (eg, cervical dilation at admission, duration of labour). These detailed data allowed both precise characterisation of the exposure of interest and adequate control of confounders. This finding of an independent dose-related association between oxytocin infusion and PPH in women not receiving prophylactic oxytocin during the third stage of labour is consistent with previous studies showing desensitisation of the oxytocin receptor after prolonged or high-dose oxytocin exposure.15 16 Similarly, a recent study of rat myometrial strips reported that oxytocin-induced contractile response decreased after pre-exposure to supraphysiologic oxytocin concentrations.17 Our results suggest that these experimental findings are clinically relevant and have implications for the use of exogenous oxytocin during labour. Conversely, results from a multicentre hospital-based study in Latin America, including 11 323 women delivered vaginally, 211 of whom had severe PPH, recently led Sosa et al23 to conclude that oxytocin during labour is not associated with severe PPH. However, this study was underpowered to detect an association of the magnitude we report here (RR: <2). Moreover, its incidence of severe PPH was higher, albeit not statistically significant, in women who received oxytocin during labour (2.4%) than in women who did not (1.9%); similarly, a higher, but not significant, risk of blood transfusion was associated with oxytocin use during labour (adjusted OR: 2.0, 95% CI 0.7 to 5.4). Thus, their failure to find a significant association cannot be considered strong evidence that oxytocin use during labour does not affect the risk of PPH, and their results do not contradict ours. Randomised controlled trials have compared protocols of active management of labour with high doses of oxytocin to protocols with low doses14 or delayed administration13 of oxytocin, and some studied PPH as a secondary outcome, but they all lacked sufficient power to assess this outcome. The dose-related relation we report here between oxytocin infusion during labour and the risk of severe PPH has implications for clinical practice. Oxytocin administered during labour, by enhancing uterine contractility, may prevent caesarean delivery for labour arrest. However, its current use during labour is unlikely to comply strictly with evidence-based indications and modalities of use. Indeed, its use in 60% of the women delivered vaginally in our study and the similar percentages reported in other developed countries10 suggests that it is now a routine part of obstetric management and commonly administered in situations where no evidence suggests that it benefits clinically relevant outcomes. The gap between the widespread use of this drug and the paucity of scientific evidence on its safety is a matter of concern. Our results provide additional evidence documenting these risks and suggest that oxytocin during labour increases the risk of severe PPH. This effect appears to be dose related and significant even at moderate doses. Oxytocin during labour appears to be an independent risk factor for severe PPH. Our findings provide new evidence emphasising the need for safeguards to minimise maternal complications when augmenting labour with oxytocin, including rigorous indications, use of the minimum useful dose and careful efficacy evaluation. Future large studies investigating these three key points should be undertaken to validate the use of this old drug in a modern and safe practice. The authors want to thank the staff from the participating maternity units for identifying cases (list of hospitals in Appendix) and the Pithagore6 collaborators for their contribution in the design and conduct of the initial project: Céline Chauleur, Cyrille Colin, Thierry Harvey, Jacques Lansac, Xavier Morin, Gilles Pennehouat, Sandrine Touzet, Muriel Rabilloud, and Véronique Tessier.
. WHO analysis of causes of maternal death: a systematic review. Lancet 2006;367:1066–74.
. Identification of severe maternal morbidity during delivery hospitalizations, United States, 1991-2003. Am J Obstet Gynecol 2008;199:133.e1–8.
. Severe maternal morbidity during pregnancy, delivery and puerperium in the Netherlands: a natiowide population-based study of 371 000 pregnancies. BJOG 2008;115:842–50.
. Trends in postpartum hemorrhage: United States, 1994-2006. Am J Obstet Gynecol 2010;202:353.e1–6.
. Investigation of an increase in postpartum haemorrhage in Canada. BJOG 2007;114:751–9.
. Trends in postpartum hemorrhage in high resource countries: a review and recommendations from the International Postpartum Hemorrhage Collaborative Group. BMC Pregnancy Childbirth 2009;9:55. American College of Obstetrics and Gynecology Committee on Practice Bulletins-Obstetrics. ACOG Practice Bulletin Number 49, December 2003: Dystocia and augmentation of labor. Obstet Gynecol 2003;102:1445–54.
. Oxytocin: new perspectives on an old drug. Am J Obstet Gynecol 2009;200:35.e1–6.
. A protocol for use of oxytocin. Am J Obstet Gynecol 2007;197:445–6.
. Outcome in obstetric care related to oxytocin use. A population-based study. Acta Obstet Gynecol Scand 2006;85:1094–8.
. Risk factors for postpartum hemorrhage in vaginal deliveries in a Latin-American population. Obstet Gynecol 2009;113:1313–19.
. Oxytocin versus no treatment or delayed treatment for slow progress in the first stage of spontaneous labour. Cochrane Database Syst Rev 2011;(7):CD007123.
. High-dose vs low-dose oxytocin for labor augmentation: a systematic review. Am J Obstet Gynecol 2010;203:296–304.
. Loss of myometrial oxytocin receptors during oxytocin-induced and oxytocin-augmented labour. J Reprod Fertil 2000;120:91–7.
. Oxytocin-induced desensitization of the oxytocin receptor. Am J Obstet Gynecol 2003;188:497–502.
. Oxytocin pretreatment decreases oxytocin-induced myometrial contractions in pregnant rats in a concentration-dependent but not time-dependent manner. Reprod Sci 2009;16:501–8.
. Postpartum hemorrhage today: ICM/FIGO initiative 2004-2006. Int J Gynaecol Obstet 2006;94:243–53.
. Factors associated with postpartum hemorrhage with vaginal birth. Obstet Gynecol 1991;77:69–76.
. Oxytocin exposure during labor among women with postpartum hemorrhage secondary to uterine atony. Am J Obstet Gynecol 2011;204:56.e1–6.
. Obstetric risk factors and outcome of pregnancies complicated with early postpartum hemorrhage: a population-based study. J Matern Fetal Neonatal Med 2005;18:149–54.
. Use of oxytocin during early stages of labor and its effect on active management of third stage of labor. Am J Obstet Gynecol 2010;204:238.e1–5.
. Incidence and predictors of severe obstetric morbidity: case-control study. BMJ 2001;322:1089–93.
. Multifaceted intervention to decrease the rate of severe postpartum haemorrhage: the PITHAGORE6 cluster-randomised controlled trial. BJOG 2010;117:1278–87.
. Normal labor and delivery. In: Cunningham FG, Leveno KJ, Bloom SL, et al., eds. Williams Obstetrics. 23rd edn. New York (NY): McGraw-Hill, Medical, 2010:374–406.
. [Trends in perinatal health in metropolitan France between 1995 and 2003: results from the National Perinatal Surveys]. J Gynecol Obstet Biol Reprod (Paris) 2006;35:373–87.
. Postpartum hemorrhage–update on problems of definitions and diagnosis. Acta Obstet Gynecol Scand 2011;90:421–8.
. Minimum oxytocin dose requirement after cesarean delivery for labor arrest. Obstet Gynecol 2006;107:45–50.
. Oxytocin requirements at elective cesarean delivery: a dose-finding study. Obstet Gynecol 2004;104:1005–10.
. Implementation of a conservative checklist-based protocol for oxytocin administration: maternal and newborn outcomes. Am J Obstet Gynecol 2007;197:480.e1–5.
. For how long should oxytocin be continued during induction of labour? BJOG 2004;111:331–4.
. Improving patient safety and uniformity of care by a standardized regimen for the use of oxytocin. Am J Obstet Gynecol 2008;198:622.e1–7. Funding The Pithagore6 project was funded by the French Ministry of Health under its Clinical Research Hospital Program (contract number 27-35) and the Caisse Nationale d'Assurance Maladie (CNAMTS). JB was supported by a grant from the Fonds d'Etudes et de Recherche du Corps Médical of Assistance Publique Hôpitaux de Paris. These funders had no role in the design and conduct of the study, no role in the collection, analysis or interpretation of the data and no role in the writing of the manuscript or in the decision to submit for publication. Ethics approval The Sud Est III Institutional Review Board and the French Data Protection Agency (CNIL) approved the study. Contributors JB participated in the design of the study, conducted the analysis, participated in the interpretation of the data and the drafting and revision of the paper and has seen and approved the final version. He has no conflicts of interest. GK participated in the design of the study, supervised the analysis and interpretation of the data and participated in the drafting and revision of the paper. He has seen and approved the final version. He has no conflicts of interest. CD participated in the design of the study, obtained funding for it, participated in the central monitoring of data collection, the cleaning of the data and the revision of the paper and has seen and approved the final version. She has no conflicts of interest. R-CR initiated the collaborative project, obtained funding for it, participated in the design of the study and the revision of the paper and has seen and approved the final version. He has no conflicts of interest. M-HB-C participated in the design of the study, obtained funding for it, participated in the revision of the paper and has seen and approved the final version. She has no conflicts of interest. CD-T participated in the design of the study, obtained funding for it, participated in the central monitoring of data collection, supervised the cleaning, analysis and interpretation of the data and the drafting and revision of the paper and has seen and approved the final version. She had full access to all the data in the study and had final responsibility for the decision to submit for publication. She has no conflicts of interest.